We are a consulting and diagnostic company, independent from manufacturers and suppliers. We serve only one master: YOU. We offer our remote services such as computer simulations, and drawing reviews worldwide, including China (e.g., Wuhan, Shenzen, Shanghai, Kunming), Middle East, and Africa. More about us. We assist designers and attorneys in analyses and presentations of physical processes before or after these processes occurred in buildings. 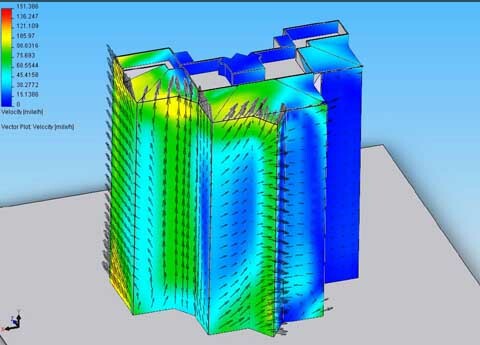 We offer a variety of computer simulations addressing various asspects of building performance, such as thermal, moisture, optical, solar, daylight, acoustic, and air (wind) movement. We are recognized as a world-class leader in the field of 3-dimensional computer simulations. Many of these state-of-the-art services are unique worldwide. We are a direct provider, which explains why our prices are low and quality is high. Feel free to add a markup if you are a re-seller. Glass is seldom matched properly, as seen on the photo below. 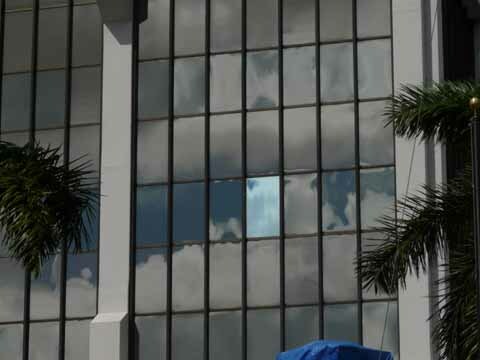 See the video below (3MB) illustrating the importance of the glass matching done right. Sample daylight studies. Starting at $$. How much energy can you save by adding exterior shading? What would be the return on investment on a better window? How about adding a shaded patio? Wouldn't it get too dark inside? 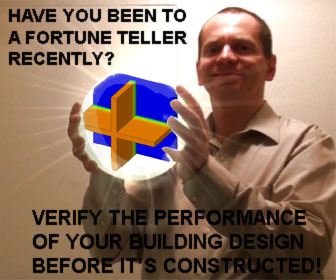 The only way to find out is to simulate these alternatives ahead of time, because the same component would perform differently in different buildings. These analysis are performed for identififcation of comparative energy impact of individual components of a building. 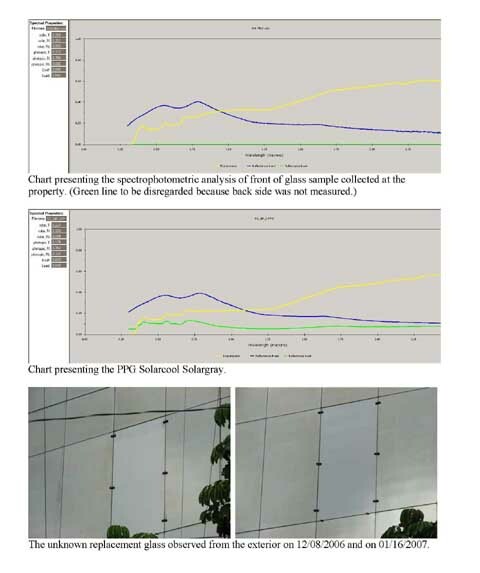 Sample solar studies. Starting at $$. 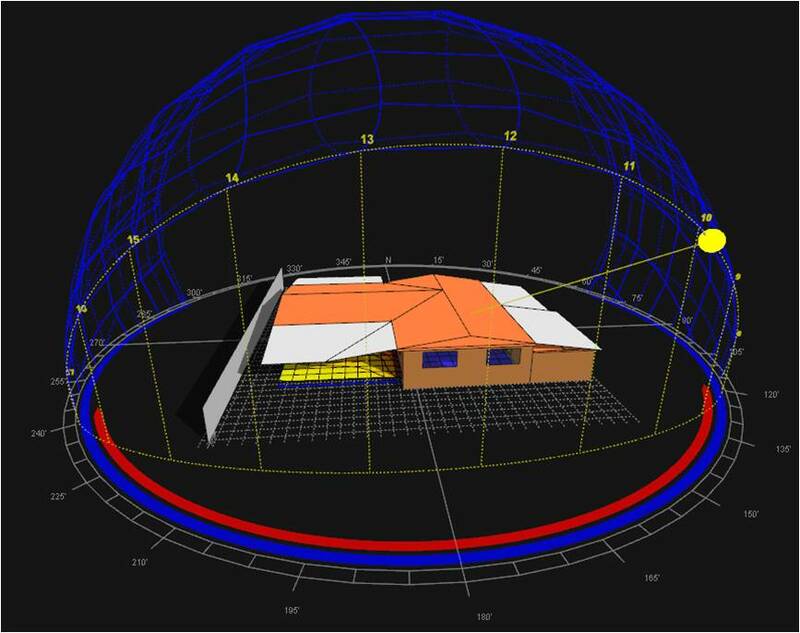 Whole Building Energy Modeling Performed for the comparative analysis of design trade-offs to meet the predefined energy goals. Also, it's an important part of the energy rating process, particularly whencombined with the air tightness verification in the field. arting at $. 2-Dimensional Steady State Thermal Analysis Performed on simple assemblies to identify the thermal transmittance (U value) and assess the condensation risk. These NFRC-compliant simulations are nationally accepted as an alternative of the expensive laboratory testing of fenestration. Also, this analysis yield SHGC of the fenestration. Sample 2-Dimensional Steady State Thermal Analysis. Starting at $. 3-Dimensional Steady State Thermal Analysis Performed chiefly to assess the condensation risk of those details that escape the 2D representation, such as shading brackets, anchors, and framing interstections. Invaluable in verification of impact of thermal bridging caused by components penetrating the heat-control layer in two directions. 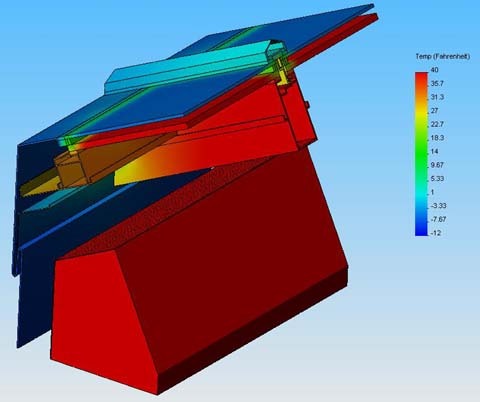 Sample 3-Dimensional Steady State Thermal Analysis, revealing the thermal irregularities at the skylight rafter. Would the water condensing underside the glass be drained safely outside in a winter? Only the 3D simulation can answer a question like this. In this example, the condensate drainage channels were found to freeze, which would prevent water discharge, and lead to water damage. 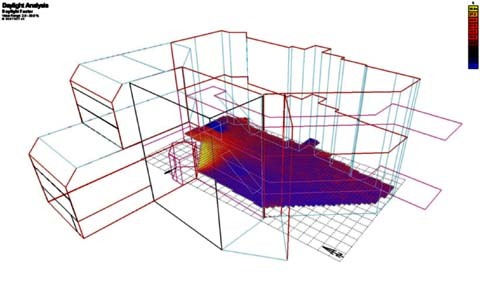 3-Dimensional Transient Thermal Analysis Performed to assess the passive solar design with materials of large heat storage capacity or to assess the condensation risk. 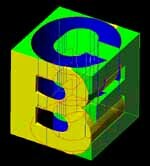 Useful in analysis of 3D assemblies made of high-heat storage capacity materials, such as masonry and concrete precast. Would they store and release enough heat to ride through the cold winter night? Would they absorb enough heat to ride through the hot sunnmer day?We would give you the answer. 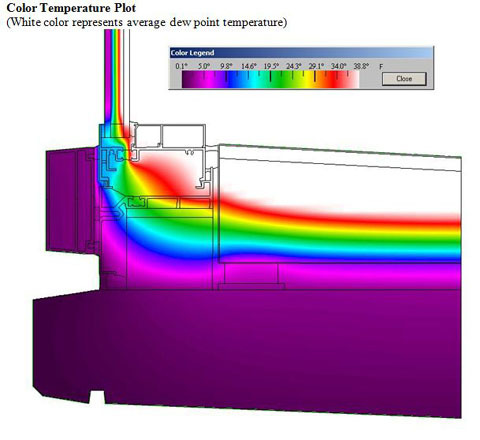 Sample 3-Dimensional Transient Thermal Analysis. Starting at $$$. One-dimensional Transient Hygrothermal Analysis Would there be a water damage inside, at the absence of any rain intrusion or plumbing leaks? Microbial growth? We found the answer in many cases is yes. 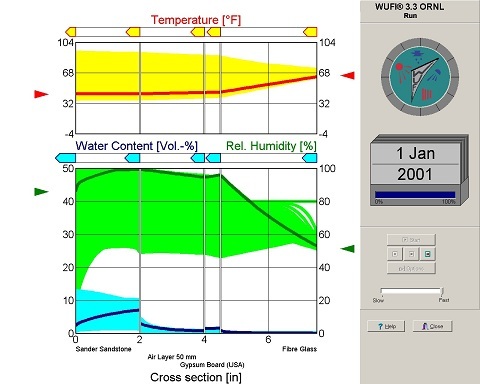 Computational Fluid Dynamics Performed as a virtual wind tunnel analysis (e.g. for shape optimization or tracing windborne projectiles) or for identification of boundary conditions for thermal analysis. Sample Computational Fluid Dynamics Analysis. Starting at $$$. 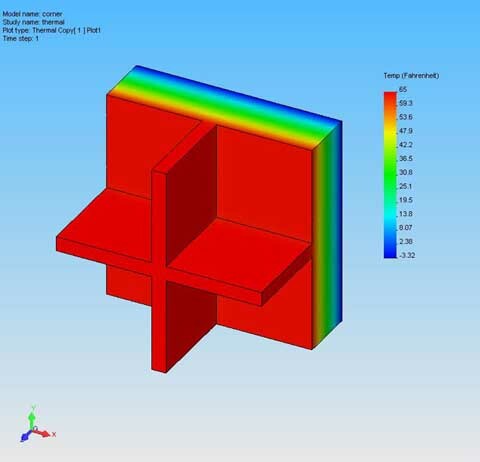 3D Static Simulations Performed for verification of stresses in the material or assembly.